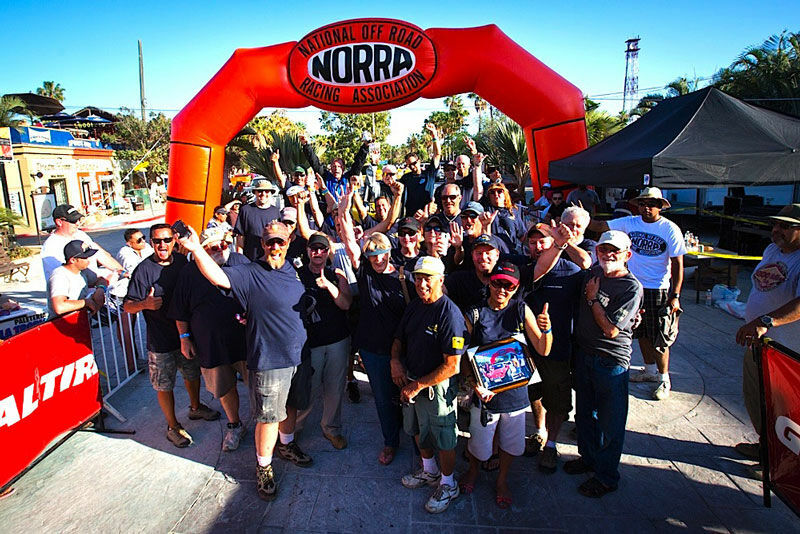 (Agua Dulce, Calif.): With off-road desert racing’s summer hibernation now up shifting into the frantic pace of fall, the National Off-Road Racing Association (NORRA) today announced the official dates for its 6th Annual General Tire NORRA Mexican 1000 rally. Working in association with local and state officials, the vintage-themed event – known affectionately as “The Happiest Race on Earth” is scheduled to take place from Sunday, April 26 through Wednesday, April 29, 2015. Once again, a diverse field of over 200 trucks, sedans, buggies and motorcycles are expected to take on a 1,300-plus mile, four-day on and off-road rally from the starting line in Ensenada, Baja, Mexico to the white sand beaches of the resort destination of San Jose Del Cabo at land’s end. 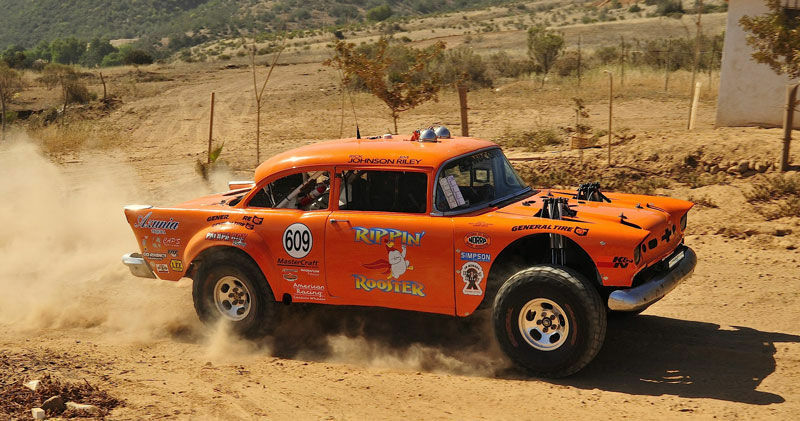 Classic race cars like this class-winning "Rippin' Rooster" Chevy sedan are huge part of the NORRA Mexican 1000 success story. For 2015 Event officials will put a renewed emphasis on balancing the needs of its vintage classes with the rally's growing popularity. In keeping with a popular NORRA tradition, online registration for all participants in the 2015 Mexican 1000 will once again commence precisely at 12:00pm (noon, PST) on New Year’s Day, January 1st. As is the case every year, early entrants are guaranteed "first in, first out" starting positions within their category on Day 1 and "first come, first served" room reservation guarantees from NORRA at the Day 1 overnight stop in Bay of Los Angeles (four wheel vehicles only). While NORRA hosted its Mexican 500 “La Carrera Del Norte” last October, rally organizers have decided to concentrate its current efforts in fine-tuning its Mexican 1000 rally experience for competitors, sponsors and media guests at this time. As an example, in 2014 the Mexican 1000 dates were two weeks later in May, but customers were concerned about competing during a very special time for families. Like it has since 2012, next year the General Tire Mexican 1000 will once again finish in the picturesque downtown plaza of San Jose del Cabo. The rally will again conclude mid-week with a huge seaside award's presentation on white sands of southern Baja. NORRA is also looking to refine and enhance its unique multiple course, multiple city format that was first instituted earlier this year to provide a greater margin of safety for the rally’s two and four-wheel classes. Trying to maintain a careful balance of managed growth without losing the very essence of what has become the cornerstone to the event’s remarkable growth, rally organizers are recommitting themselves to the Mexican 1000s many vintage vehicles and motorcycles next year. NORRA is expected to announce more schedule and course details in the coming weeks as it prepares for its annual attendance at the Lucas Oil Off-Road Expo and the SEMA show in Las Vegas. In addition to General Tire, NORRA is also supported by General Tire, American Racing Wheel, Azunia Tequila, South Point Hotel and Casino, Walker Evans Racing, Bilstein Shocks, KC HiLites and MasterCraft Safety.